Sunpentown - SD-71E: Dehumidifier Review • The Air Geeks, reviews of air conditioners, dehumidifiers and air purifiers. High levels of moisture in the air can damage your household items and cause mold to flourish in your room. It is an uncomfortable experience to stay in a dumpy room, and to transform the environment of your room, you need a dehumidifier. The SPT SD-71E is a 70-pint humidity control system that is designed to ensure that your room has a comfortable environment. This high-efficiency, low-consumption dehumidifier comes with an affordable sticker. So where is the catch? Our review. The SPT SD-71E is a strong humidity control unit that is designed to draw moisture from the air effectively and quietly. This unit is optimized to enable you to maintain the humidity of your room within comfortable levels. A first, good point to make is that the SPT delivers on its promise to dehumidify with high efficiency. The SPT SD-71E is actually capable of removing up to ~50 pints of moisture from the air in 24 hours in very moist environments. This is no small feat in comparison with competitors who, despite announcing 70-pints per 24 hours of dehumidification, often fall short of 35 pints. This makes it an ideal option for medium and large rooms. The inconspicuous, yet elegant design and the smart, intuitive command also speak in favor of the SPT. Whether you intend to use this unit in your house or office, it is designed to allow you to adjust the humidity of your room to a desired level, down to a lowest level of 35% RH. Thanks to its two fan speed options, Normal and Turbo, you also choose the speed of the deed (but warning, faster means louder!). But faster also means more demanding in terms of energy! One should not forget to check the power needs of an appliance before purchasing it, as high energy requirements can negatively affect your electricity bill. The SPT SD-71E is an Energy Star rated appliance and it is optimized to deliver great performance while consuming minimum power. This unit helps you to save money while transforming your room into a comfortable environment. In case you are looking for a unit that will not adversely affect your bill, then this unit is ideal for you. The SPT SD-71E features a full bucket indicator to notify you that you should empty the reservoir. What happens when the tank is full and you are not available to empty the tank? You should not worry. This unit is designed to go off if the tank is full. This helps to prevent water spillage in case you are not available to empty the reservoir. In case you don’t want to keep emptying the tank, you can use the continuous drain option. All you will need for this option is a standard garden hose. Furthermore, the SPT SD-71E is designed to restart automatically after a power outage. It stores the settings in its memory and therefore does not require you to set it again. So, green light then? Not quite. One major drawback is in the tendency of some units to stop functioning well after a dozen months of intensive usage. Particularly, a small fraction of users has complained that this unit started to give error codes (EC error code) after running for around one year, which could indicate a faulty sensor. This lack of durability has to be factored in your decision : however satisfactory a unit may be, the only way you can recoup your investment is if it lasts a long time. In this case, unfortunately, some users have doubts. Quiet operation. Many users have indicated in various review forums that this dehumidifier is quieter than most systems of same capacity. It does not produce horrible sound. Highly effective. A great percentage of users have expressed satisfaction with its performance. It effectively draws excess moisture to make your room a comfortable place. Problems might appear after a year of use. These occurrences, however rare, are a problem that we do not want to have to face down the road! Some of this model’s details are poorly designed. 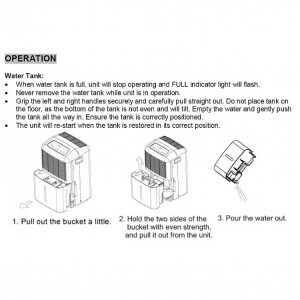 Users have complained that their buckets get stuck either when removing it to empty the accumulated water or when returning it. We live in Arizona, and while hot and arid 7-8 months out of the year, the summer monsoons raise the humidity to obscene numbers. That humidity finds it's way into your home and causes your air conditioner to work extra hard and longer to pull that humidity out of the air. This year we decided to purchase a dehumidifier--the older you get the harder it is to acclimate to hot, humid weather. ;-) After reading the reviews on the majority of dehumidifiers both on the internet and Amazon, we decided to purchase this unit. The features like auto on/off, thermostat (humidostat? ), turbo speed, timer function, etc., made us to decide to go with as many features possible so that we could customize based on our need. Additionally, the price was a big factor--this is a good value." Just wanted to let everyone know that this dehumidifier failed to work right as it passed the two year mark. It came up with a code of EC and would not stay running afterward. The EC code says that the ambient temperature will not allow it to run. I guess I should have bought the extended warranty. Anyway, will be replacing it with another brand shortly. Very pleased with the dehumidifier and also I am glad other users took time to comment on it so I could use their comments to make a decision to buy it. It is quiet enough when running. I would say about as loud as a floor fan on medium. I do like the digital indicator that shows the humidity level by exact percentage (like 51 percent) when it is running. When hooking up a drain hose though you can't tighten it up too tight as it has plastic threads. Might look into finding a plastic hose lead in attachment instead of the metal one that may wind on better as if you tighten it too much it slips off with a normal metal end. I believe it is a great unit and looks like it is draining well. I like that it vents to the side too since I have it running under the stairs and sitting in front of a wall vent to the laundry room area and draining to the water heater drain area. Don't hesitate to buy this one as it works well." The SPT SD-71E is a satisfactory dehumidifier that is optimized to give your house a comfortable environment. This unit allows you to control the humidity of your room with ease (intuitive commands) and it designed to deliver optimum performance while consuming minimum energy (Energy Star rating), rather quietly. However, the possibility that small imperfections might show up down the road, as has been reported by a few users, is enough for us to downgrade this model, which otherwise would approach excellence.